KIEV, Ukraine -- One of the most dangerous elements of Ukraine’s nearly two-year-old conflict remains the unpredictability of its neighbour Russia’s tactics. Russian soldiers in Eastern Ukraine. Despite repeated expressions of support for the Minsk peace process and recognition of Ukraine’s sovereignty over the separatist Donetsk and Luhansk People’s Republics (DNR, LNR), Moscow’s current actions in eastern Ukraine seem designed to strengthen those entities than prepare them for dismantlement. The cease-fire agreed in Minsk in February 2015 has mostly held since September. But with little progress in the implementation of the overall Minsk accord, the situation remains volatile and tens of thousands of troops face each other along a 500-km line of separation. Those living in the separatist-controlled regions are left wondering what their future has in store for them. Meanwhile, close to 10,000 people have been killed since mid-2014. The Kremlin, on the other hand, views Ukraine’s shift towards the EU and NATO as a major security threat and the 2014 overthrow of President Viktor Yanukovych as a Western-backed campaign aimed at isolating Russia. As a result, Russian President Vladimir Putin wants to keep Ukraine unstable and embroiled in an open-ended, not-so-frozen military conflict with the aim of eventually returning it to its sphere of influence. Anything, including more serious fighting, is possible. Until there is a clear positive change in the Russian approach, the international community needs to build its policy toward Moscow over eastern Ukraine on that assumption. Large Russian units have already fought twice in Ukraine, even during peace talks in February 2015. Moscow could resort to such means again should the lower-cost, lower-visibility approach of supporting the Donetsk and Luhansk entities in a protracted conflict fail. Should Moscow want to prove its attachment to the Minsk process, however, there are concrete steps it could take. It could, for example, withdraw the regular military units that it maintains in the DNR and LNR. It already has substantial forces on the Russia side of its border with Ukraine, which are at most an hour or two away from the line of separation. The quiet removal of these units would substantially increase Ukrainian and Western confidence that Russia is indeed committed to Minsk. Russia could also reduce military supplies to the entities. Cuts in fuel, lubricants and ammunition for artillery and other heavy weapons would gradually diminish their forces’ mobility and effectiveness. As Russia still denies providing such items, this could be done with minimal publicity or face loss. The international community, including the US, might offer confidence-building measures in return, perhaps including a security dialogue in the region, or consultations on ways to dismantle the poorly-disciplined LNR and DNR militaries. Russian policy towards the DNR and LNR abruptly changed in the autumn of 2015. The majority of Russian advisers (kurators), who ensure that both entities’ leaders toe Moscow’s line, were replaced, frequently by officers from the FSB, the Federal Security Service. Without explanation, Moscow also began to provide money for pensions, other social payments and government and military salaries – something Russian officials had previously intimated Moscow could not afford. The fact that the entities can now pay pensions, government salaries and social benefits with money coming from Moscow is significant, both politically and socially. Separatist officials had previously been told that Russia would intervene in the event of a mortal military threat to them or a major humanitarian crisis, but that otherwise support would be limited. Now, however, Moscow’s total outlay in pensions, allowances, state and military salaries is likely to exceed $1 billion a year in eastern Ukraine. After ignoring internal DNR political dynamics since the beginning of the war, Moscow has thrown its weight behind the top leaders of both entities – despite their ambiguous standing among many separatists. It is pushing for the creation of two political parties in the DNR, both tightly linked to Donetsk’s separatist leadership, so unlikely to differ in much but name. One, Oplot Donbassa, will probably be headed by Alexander Zakharchenko, the DNR head; the other, Donetskaya Respublika, by Denis Pushilin, a politician known for unquestioning loyalty to Moscow. This suggests a somewhat belated effort to organise politically in preparation for local elections stipulated by the Minsk agreement. Whatever the decision, a separatist official said, “you will find out about it at the same time as us – or maybe earlier”. Separatist leaders admit they are accidental rulers who moved into the political and security vacuum created by the collapse of Victor Yanukovych’s presidency on 22 February 2014 and the subsequent paralysis of the provisional central government. Few knew each other well, if at all. Their various backgrounds include links to Yanukovych’s Party of Regions, a Ukrainian oligarch, Russia’s radical nationalists, and, increasingly, organised crime. They were guided not by a single ideology or thinker, but by mixed motives: rejection of the Maidan’s “anarchy”, deep suspicion of any post-Soviet Kiev government, reflexive pro-Russian sentiments and opportunism. Their diversity, fragmentation and distrust, along with near-total lack of political or administrative experience, has militated against emergence of coherent administrations or functional political parties. This is only happening now with Moscow’s prodding. One thing the leaders of both entities have never doubted is that Russia views them as expendable. Donetsk and Luhansk were never Moscow’s main prize. For two months after Yanukovych’s fall, Moscow hoped for an uprising in the rest of the “historically Russian” oblasts of the south east and was deeply disappointed when it did not happen. Even the most pro-Russian, separatist leaders openly say Moscow could drop them at any time. Asked about this, one official believed at the time to have good contacts in Moscow sidestepped what he called this “a complex, slippery question”. Another, widely believed to have stayed at the top thanks to extensive Russian support, refused to rule out such an eventuality, referring to what he complained was constant in-fighting in Moscow. DNR and LNR leaders admit their role is very circumscribed. They are completely excluded from decision-making process on Minsk implementation. There, Moscow controls “every phrase, every comma”, a senior DNR official says. A top figure explained that Moscow is playing a long game: sometimes the small separatist islets are helpful, sometimes a distraction, but the main aim is ultimate return of the whole of Ukraine to Moscow’s sphere of influence. While publicly insisting that Moscow’s political and military influence over the entities is minimal, DNR leaders privately admit their total dependence. Alexander Khodakovsky, the DNR security council secretary, recently spoke of the leadership’s constant efforts to balance the desires of the Donbass population and of “the top political powers”, by which he meant Russia. In the same interview, he said Russian “material support” is 70 per cent of the DNR budget. Many observers and officials believe it is at the very least 90 per cent. Russia provides everything, another leader said, expressing frustration at the public’s lack of appreciation. “They don’t realise who is providing gas for heating, fuel for vehicles, money for basic goods. Russian troops are the key to LNR and DNR survival. On the other side of the line of separation, Ukrainian security and military specialists admit they are more observers than participants in the current stage of the conflict. “Everything depends on one man, Putin”, said a prominent Ukrainian security analyst. The Ukrainian side can only watch and try to guess what Russia is planning. 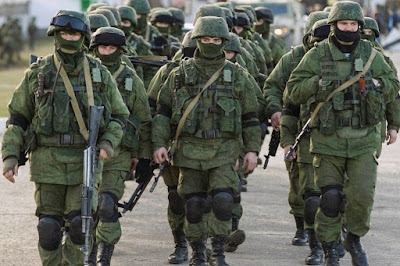 Russia’s reorganisation of the LNR and DNR militaries seems, he said, aimed at creating large, well-equipped border guard forces, with impressive armour resources, should Russia decide to keep the entities alive for a few more years. The civilians: Victims, bystanders or accomplices? There are no reliable opinion polls in the east and no clear estimate of even the population of the separatist entities. Fragments of information and conversations with residents suggest that the separatists lack broad social support, but that acceptance will grow if easterners continue to feel Kiev has no interest in them. The popular mood, a Donetsk resident said, seems to be “to avoid contact with the regime as much as possible”. An active civil society figure said the population is split roughly three ways: for the regime, against it and neutral. The strongest pro-separatist constituency is probably pensioners, villagers and unskilled workers; the middle class generally keeps its distance, he said. The recruiting difficulties the DNR and LNR face is one of the clearest measures of popular attitude towards the separatists. In May 2014, at the height of the battle for Slavyansk, the separatist commander in chief, Igor Girkin (Strelkov), complained of the difficulties of finding even 1,000 volunteers among Donetsk Oblast’s 4.5 million people. Unable to raise able-bodied fighting men, he scornfully opened recruitment to women. To support the armed struggle, Russian nationalists recruited and equipped volunteers to fight, raising money by appeals on the Internet and metro stations in Russia’s big cities. Support for the separatists may grow if easterners remain cut off from Ukraine’s economic mainstream. Economic hardship and the financial restrictions risk intensifying the feeling among residents of the east that Kiev has written them off. This will further complicate the region’s future reintegration into a united Ukraine. The Kiev government urgently needs to work on long-range contingency planning to address this issue. Senior DNR and LNR leaders watch Moscow closely for subtle changes in mood or message. In the short term, they are confident they will be protected if Kiev attacks. But they have no idea of their ultimate fate. “There is one thing our kurators cannot explain,” one of the highest said. “That is what is happening in the Kremlin. They don’t know themselves”. A sophisticated DNR analyst views the opacity of its intentions as proof Moscow is not yet agreed on a way out of the eastern Ukraine morass. Division in the Kremlin on Ukraine is manifested on the ground by lack of both political and military coordination. Different “towers of the Kremlin” are fighting each other, the analyst said. Both Moscow and Kiev would love to escape this situation, but “need to be able to offer their people the illusion of victory”. Indications that Moscow is simultaneously examining several possible outcomes are not new in Vladimir Putin’s Russia. Improvisation is an inherent part of its policymaking process. Some prominent Russian analysts, in public unflinchingly supportive of their president, say he is neither a tactician nor strategist, but a fatalist, making bold but uninformed decisions and embarking on risky political courses without fully knowing where they will lead. Public support for the Minsk peace process is steadily waning in Kiev – a well-regarded Ukrainian poll in late November reported 16.1 per cent of respondents were positive towards Minsk, down from 34 per cent in March 2015. Ukrainian political leaders are aware that international attention has shifted from their conflict to Syria’s and believe that the EU consensus in favour of sanctions will end in the next half year, though senior Western diplomats say that US and key Western leaders are firm about maintaining them. Full Minsk implementation might allow Moscow to exit the east with some dignity intact. But It would require Russia to wind up the separatist enclaves, thus abandoning the political thorn in Kiev’s side that it had hoped would further slow political and economic reform in Ukraine. Freezing the conflict has its attractions. Moscow’s allies would remain in control and pressure would be maintained on the Ukrainian government. A situation of neither war nor peace would hamper reform in Kiev, but benefit corrupt figures there, rich separatist leaders and possibly some among the Moscow elite. It would also postpone thorny problems, such as what to do with the DNR and LNR militaries and reinforce warnings to other neighbours of the risks of closer ties with the West. But it would cost Moscow a lot of money. The EU, US and allies must keep up the pressure on Moscow to take steps to clarify and demonstrate its intentions. And they should never forget that the military option is still on the table for Russia, which has kept its pipeline to the entities open and has shown itself ready to use its troops on Ukrainian territory. The European Union (EU), especially member states Germany and France, and the US should avoid the trap of letting a potentially lengthy resolution process and different interpretations of its provisions undermine their vital consensus on maintaining sanctions until Minsk is fully implemented. While pressing Moscow on its plans international actors should both warn President Putin explicitly of the dangers of substituting something else for Minsk and remind him that if and when he wishes to extricate himself from eastern Ukraine, they can help.